FA: Jim Dunn 1973? or possibly Dr. Hemlock? Difficult for the grade. Clint Eastwood was featured in the movie “The Eiger Sanction” climbing in the top of the cave. Climb a right-facing corner to a bolted anchor just right of the cave. It is possible to continue up the wide corner and out the roof above the first anchor to another bolted anchor. 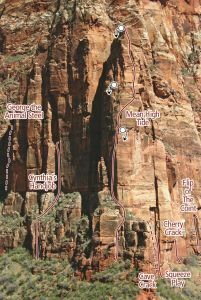 Most parties either walk left, out of the cave, and back around to the base of the route or rappel with 1 rope. It’s possible to scramble into the cave to set up a toprope on Pitch 1. Rack: 2 ea to 3.5”, one 4”, nuts optional, 1 rope. Which SuperTopo guidebooks include a topo for Cave Crack?